Savour food – Great ingredients – Two Alberta cheesemakers make Canadian Cheese Grand Prix finals and here’s a dozen more to celebrate while we’re at it. Taste Alberta: Two Alberta cheesemakers in Canadian Cheese Grand Prix finals. The Taste Alberta feature above by Lisa Montorton celebrates the fact that two Alberta cheese makers, Sylvan Star and Latin Cheese Co., have both made the Canadian Grand Prix finals. When I read this piece it reminded me that I did a lot of research into Alberta cheese makers last year for an assignment I received from City Palate magazine. I don’t know who was more suprised by how many cheese makers I found in this province, me or my editor. It was a delight to discover 14 different artisans and to know we have this great ingredient to add to our larder of local. What follows are the two pieces I wrote on this topic City Palate magazine in 2012 (updated). I hope they will be of use to my fellow Albertan cheese lovers. It turns out, we have a lots of this great ingredient to help us savour our food. Big and industrial vs. small and family run: these are the Goliath and David of agriculture and just as David used creativity to survive so are the new breed of farmers. Cheese making has become a model of ingenuity they are turning to in hopes of sustaining their small farm way of life. Canadians eat 12.66 kg of cheese per capita annually and that intake has been on a steady incline for 20 years. We travel and have acquired tastes for foreign delicacies but want to buy local to decrease our carbon footprint. Several Alberta farmers have either immigrated with artisan cheese making skills or have gone travelling in search of those farmstead skills. Here, we’ll take a closer look at these factors and the compelling stories behind what it takes to turn cheese making dreams into reality in these stormy times for farming. These new kids on the cheese making block are an example of recent immigrants bringing valuable skills and business acumen to Alberta. Take one homesick Italian craving mozzarella; introduce his cheese making cousin fresh from a career in an Italian mozzarella factory and you get a collaboration that has elderly Italians lined up out their door. Frank Fiorini and Paul Campanella have already gone from 4000 to 6000 litres of fresh Alberta Dairies whole milk delivered weekly in their first five months. While this might sound like an overnight success, the two cousins spent two years developing their business plan and negotiating with Alberta Dairy to access quota. They are on a strict timeline to establish their maximal and sustainable quota that will supply them with the milk they need for years to come. They buy the whole milk and have no guarantees if something goes wrong during production. This can happen easily if they don’t achieve a perfect pH of 5.1 to 5.2 which they need to “stretch” the mozzarella. Still they are cheerful and loving what they are doing and if you visit the factory store you might get cheese that is a few hours “fresh” and that will keep for two weeks in your fridge, getting softer and more delicious every day. James Meservy was raised on a ranch in Peace River Country and had a career in molecular genetics research in Texas when the call came from in-laws needing to retire from their ranch near Waterton. Meservy and his wife Debra took over in 2000 believing if they could find a greatly desired niche food product and make it in Alberta then they might make the farm sustainable for their own children. Enter the idea for water buffalo and their highly desired mozzarella. Meservy taught at the University of Lethbridge, worked the ranch and slowly researched and visited herds in British Columbia, Vermont, Michigan and Quebec before finally finding a willing seller in central California in 2009. Problems during importation led to one of his 10 females and the sole bull being returned. In March 2010, the first imported and already pregnant female gave birth and that brought the first opportunity to milk and make cheese. Ten years had lapsed from inspiration to making Alberta’s first home-grown batch of water buffalo mozzarella and when he tasted it, Meservy smiled. He received glowing reviews and orders began to flow in but he still had to face the problem of finding a bull to continue the impregnation and subsequent milk production of his cows and at the same time he lost access to the milk processing facility he had been using. Devastated but undaunted, Meservy took another year to secure a more permanent processing facility and to build his herd. New Year’s Eve, 2011, the first water buffalo actually conceived in Alberta was born at Old West Ranch and was aptly named Eve. Meservy is now milking, processing in a Nobleford facility and very happily delivering cheese to Calgary again. Rhonda Zuk Headon is a former agronomist who studied the science of utilizing plants for food, fuel, feed, and fibre at university but wound up analyzing fields for fertilizer applications. At age 30 she realized her work was far from her personal credo so she quit and took time off to tour Italy. She fell in love with pecorino sheep’s cheese at an organic farm in Pienza and came home to make a little cash so she could return as a WWOOFer (World Wide Opportunities on Organic Farms) volunteer for a two month apprenticeship in cheese making. Shortly after her return to Alberta, Zuk Headon married into a cattle farming family and received a sheep as a wedding present from one of the farm’s New Zealand born workers. Soon she had to get a second sheep, much to her husband’s chagrin, to prevent the first one from continuously straying. She dreamed of being a cheese maker, tried to get dairy quota for cows and failed but the inspector suggested sheep or goat milking instead. Zuk Headon, who already loved her sheep, convinced her husband to buy 100 East Friesen milking sheep in the spring of 2010. Being in relatively isolated Kitscoty also meant building their own processing facility so personal and family credit lines were leveraged to do so. The herd has now grown to 140 so Zuk Headon has lots of fresh milk from March to October and she makes her beloved pecorino every other day during that time. Zuk Headon can supply the Alberta market year round because like all great cheeses pecorino just gets better with age. Raphael Chavez was a farmer who made cheese from his dairy cow’s milk in his native Venezuela. He moved to Alberta a few years ago and took his dream of making Latin American cheeses to Alberta’s Food Processing Development Centre in Leduc where he was accepted into the Agrivalue Processing Business Incubator program. He lives and works in Calgary but five times a month travels to Leduc to process his cheeses. The cheeses are popular because of their high melting point and ability to be fried or grilled in many Latin American dishes. Check the website for some tasty traditional Venezuelan recipes for the cheeses. Chavez is proud that in just a few years of living in Alberta his cheeses are now available in over 100 stores across the province. Carolyn Van Driesten has always enjoyed working with milk, made yogurt and even tried cheese making in her own kitchen. In 2005, Van Driesten, husband Harvey and their five children started milking goats and shipping the milk to a nearby cheese plant but when prices fell in 2009 the Van Driestens made the decision to process their own milk hoping the “value added” operation would help support them. They spent a year getting licenses, equipment and studying cheese making by taking courses and reading everything they could get their hands on. Two years later Van Driesten loves working with her own family and turning milk from their own goats into a finished product for people to enjoy. She says that controlling the quality of the product; what the animals are fed, the cleanliness of procedures during milking, never using hormones or antibiotics and having customers say how much they love the end result makes all the hard work worthwhile. Noble Meadows currently yields 100 kilograms per week of cheese in addition to their milk and yogurt and has plans to expand. Look for their goat’s blue cheese coming soon. Types made: depending on the season you’ll find friesette (a soft sheep’s cheese), brie or camembert made from sheep’s milk, sheep’s feta, mixed sheep and Jersey cow milk cheddar and/or “Bergen Blue” and Stilton made from Jersey cow’s milk. While considering locations for the City Palate Foodie Tootles this year, I mentioned to Richard Harvey of Metrovino that we were likely going North to Didsbury and he perked up and said he had a sister-in-law who had just gotten her license to make farmstead cheeses in nearby Bergen. I set off to meet Sandy Easterbrook, a former art restoration expert and her retired brain surgeon husband, Bob Griebel at their lovely ranch curled up alongside Kettle Crossing Creek and facing the eastern slopes of the Rockies. This is high country and although the couple originally thought they would be vegetable growers they’ve resorted to a hay bale hothouse for a sustenance garden and have turned their attention to cheese. They have three jersey cows and eight East Friesen sheep at time of print with more on the way post lambing and calving season. 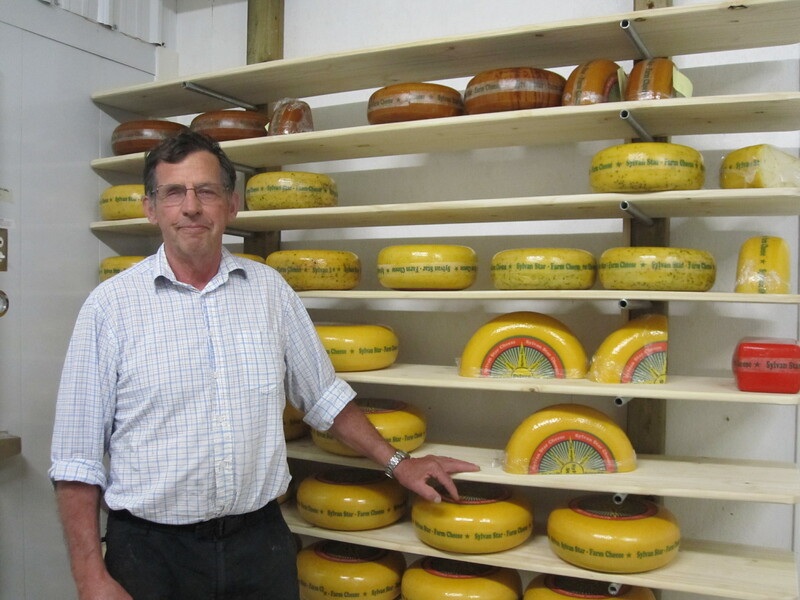 Bob built Sandy a cheese cave and the two worked through the laborious process of becoming licensed so that they may sell to the public and contribute to their community by becoming members of the Saturday morning Bergen Farmer’s Market. Sandy says this is as big as she may ever get but she’s not ruling out teaching her skills (which she acquired while the family did a sabbatical year outside Perth, Australia) to the younger generation should she be asked. City Palate Tootlers are in for a treat this summer as we meet her handsome cows and sheep and everyone else can check out these artisanal farmstead cheeses by driving to Bergen’s Saturday morning market. Cheesemaker: The facility is part of the Happy Dairies owned by Donat Koller, a BC goat cheese maker since 1993. This processing plant in Ponoka makes the Happy Days Dairies custom products. Immigrants from the Balkans, the Stanisic family have a restaurant, store and factory off Whyte Avenue in Edmonton. Leslie Sand and Alex Soreghy recently purchased Smokey Valley Cheese Goat Cheese from original owner Holly Gale and spent time learning to make these beautiful little artisanal French goat cheeses from her. They get the goat milk from a nearby farm and process it in their own on farm facility. You can join their Community Supported Agriculture to secure your share of these beautiful creations. Formerly workers on native reserves in Canada’s North, this couple is enjoying making their living from a close connection with the land. Available at: Vital Greens Farm’s farm gate store, Blush Lane Organic Market, Community Natural Foods, Sunnyside Market. 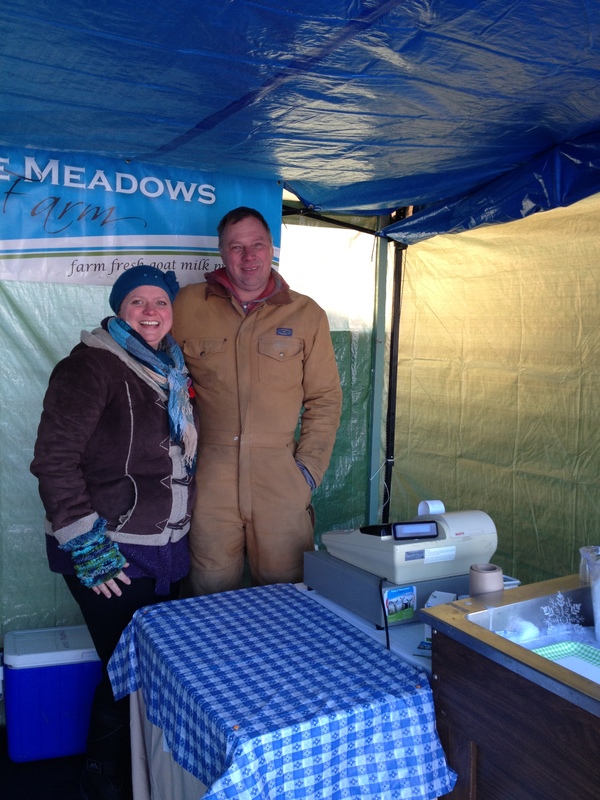 Joe Mans owns and operates one of Alberta’s few organic cow dairies with his wife and 11 children in Picture Butte. Mans has quota for 60 milking cows and expanded the operation to build an on farm milk processing facility in 2009. His cows never receive soy or corn, the milk is pasteurized but not homogenized. He says that after three years of trial and some mentoring from Gord’s Gouda of Salmon Arm he is really happy with his recipe and loves making cheese from his organic milk. Mans also makes sheep’s Gouda with milk from a neighbouring farm. Calgarians and chefs alike have come to look for the quality of Vital Green milk, cream, yogurt, butter and now they have cheese to enjoy as well. Though the Oudshoorn’s started keeping goats in the 1990’s it took until 2003 to begin producing cheeses for the public. The family moved to Fort Macleod from Nobleford to acquire enough land and irrigation water so they could produce their own organic feed and increase to the number of goats (about 450) they would need to be self-sustaining. Anita Oudshoorn had always made cheese for her family but she also travelled to Agassiz, BC to study with Debra Amrein-Boyes (one of a handful of North Americans who has been inducted into the prestigious French Cheese Guild, the “Guilde des Fromagers Confrerie de Saint-Uguzon”, which recognizes those who protect and continue the tradition of cheese making around the world.) Oudshoorn started with chèvre and feta but added aged cheese products to use up the surplus of milk summer lactation of mother goats and add to the products available year round. The goats are milked twice a day and fed an organic grain treat that the family grows on their own land. The Oudshoorn’s are in charge of the production from start to finish and they wouldn’t have it any other way. In 1994 the Beyer family immigrated from The Netherlands and by 1999 had established a dairy in Southern Alberta. 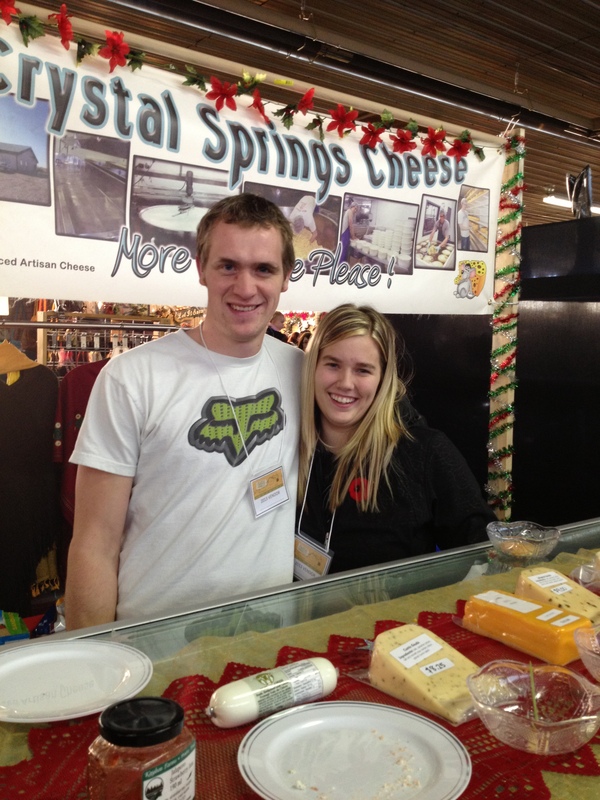 In 2005 they launched Crystal Springs Cheese factory in Coalhurst outside of Lethbridge where they produce artisan, retail and wholesale cheeses with private labels as well as the Crystal Springs and Beyers Dairies brands for most large grocery chains across the country from British Columbia to Nova Scotia. To sell cheeses across the country the factory had to achieve federal approval and is one of only four private dairies in Alberta to do so. Despite this success, owner Evert Beyer told me they are still considered a small family run business and indeed, six of his children form the back bone of the operation. Beyer is pleased and proud of the family’s achievements under the Beyer brand but he also likes to see his children go out and pursue their own passions. Jacco, the plant manager, wanted to become part of the Farmers Market community last year so he decided to bring the artisan side of the Crystal Springs brand out to the Millarville Farmer’s. I tasted the Crystal Springs Goudas at Millarville and curiosity about who was making that creamy delicious goodness was one of my inspirations to write this article. Paneer is the classic cheese of South Asia and in India where cows are sacred paneer along with ghee and yogurt, is an important source of protein for the country’s over 400 million vegetarians. The Mother Dairy website says it is an unaged, acid-set, non-melting farmer cheese made by curdling heated milk with lemon juice or other food acid and that the process is similar to queso blanco, except that paneer does not have salt added. The company is owned by the Singh family who also own Apna Punjab Sweet and Samosa Factory and Fruiticana, a popular produce and dry goods store in Falconridge. 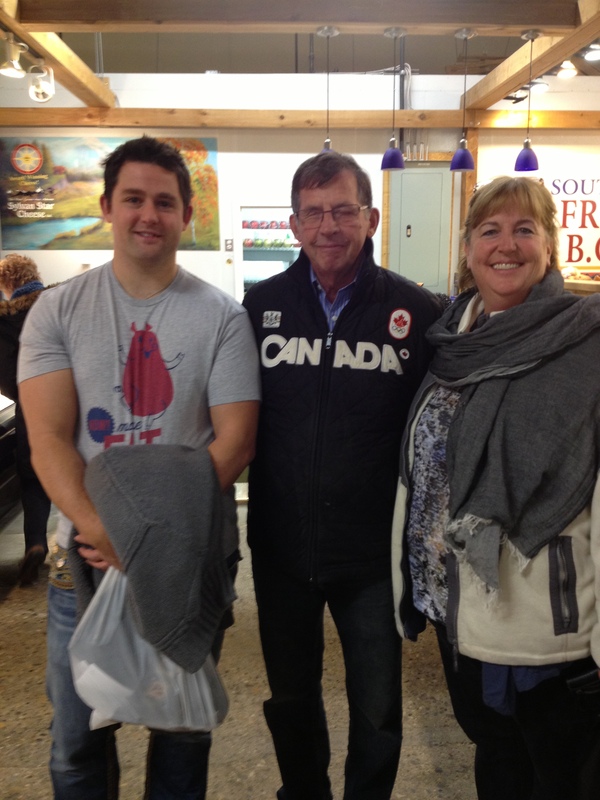 Jan and his wife Janny came to Canada in 1995 from their native Holland. Their son Jerome had established himself as a Holstein dairy farmer on a picture postcard of pastoral loveliness near Sylvan Lake and at first the Schalkwijks were content to help but then the craving for good cheese became unbearable and Jan decided to put his 30 years of cheese making experience in Holland and England to work in Alberta. The family knows a bit about cheese making as Schalkwijk’s mother once won Holland’s medal for best Gouda and had the award presented by Queen Wilhelmina. Since 2006 Sylvan Star has been racking up hardware of their own and have won Canadian Grand prix medals in almost every category they’ve entered. In 2010, Schalkwijk designed and built a 6600 square foot state of the art cheese factory next to his son’s dairy farm and has 10,000 wheels or 50,000 kilograms of cheese aging with capacity to add an additional 18,000 kilograms. It’s a big investment whose products shrink as they age but it’s a symbol of what it takes to be a great cheese maker: time, patience and the delayed gratification of delivering an artisan product worthy of its price and praise. For Jan the praise just got higher as her recently returned to Alberta with a second prize in the World Championships in Wisconsin.